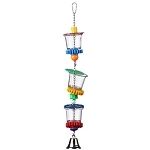 2.8 x 1 x 2.8 "
Transparent colored plastic tubes are joined into a square, and filled with small stars and rings to make a fun rattle foot toy for your bird. 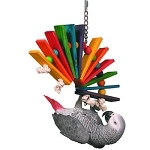 To fully exercise their fantastic feet, pet birds need a variety of objects to grasp and manipulate. Our Rattler Ring is designed for exactly that purpose. The durable plastic casing offers both smooth and bumpy surfaces. 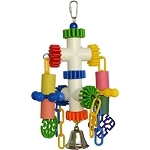 It’s filled with brightly colored rings and beads that are sure to appeal to bird curiosity. They’ll spend hours twisting and turning the Rattler Ring and you get to enjoy their fancy footwork! Q: What size tube is this? How hard is the tube? I am looking for more foot toys for our hyacinth currently useing alot of lg beak links and they work but our very quickly turned into crumbs. Thank you for contacting us with your questions. The Rattler Ring is sized more for medium to some large birds. The tube is not real thick, approximately ¾ inch diameter. We would guess that it is probably not suitable for your bird. We understand the challenges presented by Hyacinth Macaws. They are so beautiful, but active and strong birds. 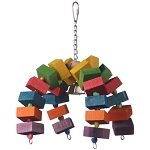 Our best recommendation for foot toys would be to visit our sister site www.makeyourownbirdtoys.com for lots of fun options to make things for your bird. Birdie Bagels, especially Macaw Bagels and Fatty Bagels http://makeyourownbirdtoys.com/Bagels-Tubes.html, These are fun to hold, play with, and shred. Acrylic Toy Bases and PVC crosses http://makeyourownbirdtoys.com/Plastic-Bird-Toy-Bases.html; These are fun to beak, and hold and manipulate by big birds. Large 28mm Plastic Beads http://makeyourownbirdtoys.com/28mm-Plastic-Bead_p_298.html, and Mega Beads http://makeyourownbirdtoys.com/Mega-Beads_p_121.html; and perhaps the Puzzle Cube http://makeyourownbirdtoys.com/Puzzle-Cube_p_148.html. The beads could be tied onto the acrylic bases by Paulie Rope http://makeyourownbirdtoys.com/Paulie-Rope_p_42.html . Hopefully this helps with some ideas, and we would love feedback on how your Hyacinth likes things. Thanks again for writing, if we can be of further assistance please let us know! Q: How are the tubes held together?